From my post on reddit: I just couldn't wait any longer so I made a few in blender + photoshop and put together the tileset in TileZed. I'm not a complete inept n00b when it comes to coding, I've got the basics down, but after 4 hours of attempting to get my mod working, I threw in the towel. Feel free to use them however and wherever you wish. The two sleeping bags with spiffio on them have a drawing from the PZ artist so don't use those if you plan on using these in any other unrelated projects. I was looking through the camping LUAs and tried to replicate tents but failed miserably. If anyone does manage to get these working properly in game, my hats off to you! Let me know too because I just want to have sleeping bags in PZ already! These should certainly be part of the base/vanilla Game! 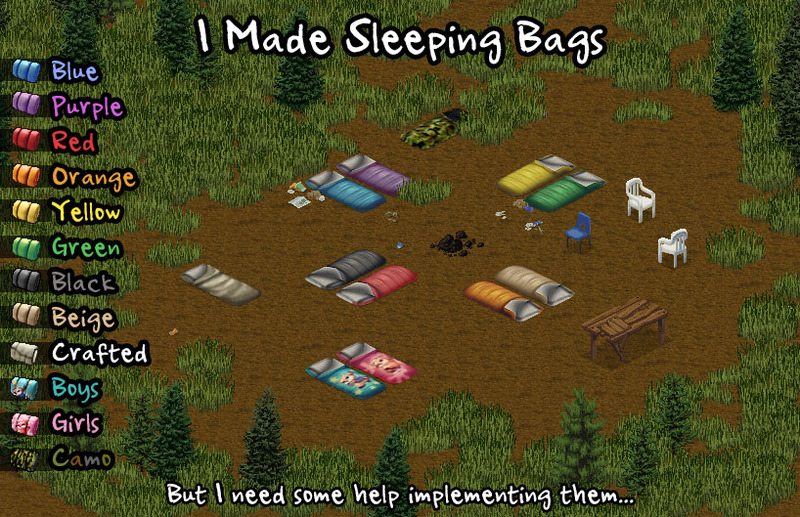 I'm especially impressed with the Spiffo sleeping bags! And whats up with that Table? The secret likely lies in how Romain implemented tents. Just do a search of the Lua folders in something like NotePad++; it should take you to the right place. Take a look at RoboMat's old sleeping mod, too. Oh yeah, I've been digging around in the LUAs the last couple days and am just trying to wrap my head around how tents work or how I would implement a custom script without butchering the original. in the campingTent.lua I see where it's referencing a sprite (o:setNorthSprite("TileIndieStoneTentFrontLeft")) but I haven't got a clue on how to call a custom sprite. I'm not even sure how any of these scripts are called to begin with. If I were to make a new "sleepingbags.lua" script, how would I call those scripts in-game? Thanks for the tip on RoboMat's mod EnigmaGrey! Their LUAs seem to only be in the /shared folder. Would I need any scripts in there? I'm not sure this is what I was looking for to help get me started. I'm a real novice when it comes to scripting so it's difficult for me to figure out what's exactly needed or where to even start but any other help to point me in the right direction would be greatly appreciated! In this case you'd place the sprite in \mods\sleepingbags\media\textures\ for single objects in a png file. For tilesheets it's . . . well, haven't quite figured that out yet. You use Tiled to pack tilesheets into a texturepack then place it in \texturepacks\ rather than \textures. This is all new to me, so. Shared should be fine. Both Shared and Client are loaded when the game boots up, or when a mod is selected in single player. 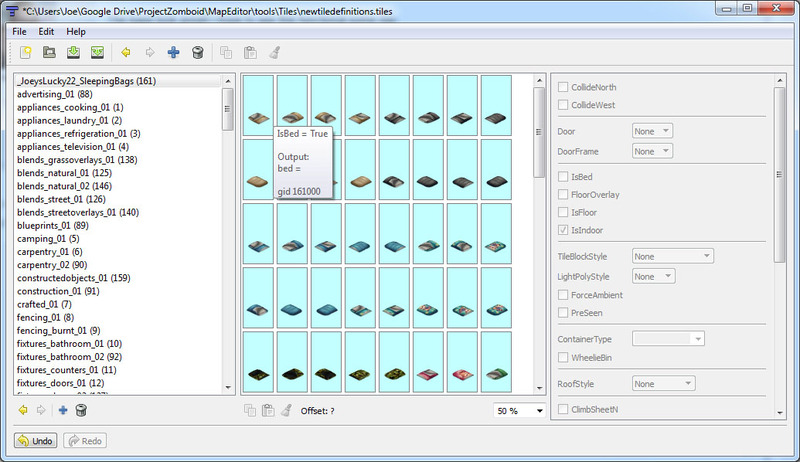 Like EnigmaGrey said tilesheets are used to make texture packs . I don't know how to import packed texture in lua. The bags look great! I hope to see this functional some day. When "_Joeyslucky22_SleepingBags" is added, it's given the GID of 161. So the first tile is "161000".